In relative terms pumps are efficient machines, most operating near 75% efficiency. Because of this relatively high efficiency it is easy to dismiss the potential energy savings that exists by optimizing pumping systems. A pump is very sensitive to how it is operated and it is the pumping system that has the greatest influence on pump energy use. Energy can account for as much as 75% of a pump's total cost of ownership. A pump converts mechanical energy into pressure energy, which is imparted into a fluid, which in creates flow. A pump can be very efficiently designed yet it can be operated in an inefficient manner. Typically, pumps run at a fixed speed with a throttling valve on the pump discharge to regulate pump output. Think of this as operating your car with the gas peddle mashed to the floor and regulating your speed by applying the brake... not an efficient method of control. A variable speed drive system adjusts the pump output to meet the system requirements. As the system requires less water, the system delivers less water. Like smoothly operating the gas peddle on your car... always just giving it enough gas to control speed... an efficient method of control. The variable speed drive system includes a speed controller (AC frequency drive) that adjusts the speed of the pump motor. Flow varies directly with the speed of the motor. Pressure varies with the square of the speed of the motor (one half speed = 1/2 flow and 1/4 pressure). A pressure transducer senses the supply line pressure and sends a signal to the drive control. The drive control interprets the transducer signal and sends a speed signal to the pump motor. The motor speed is varied to maintain a constant line pressure. As the line pressure increases due to mold temperature controller cooling valves, heat exchanger valves and chiller condenser valves closing, the water flow demand decreases. When this occurs, the drive control slows the motor speed to reduce flow and pressure. When line pressure decreases below the set point (caused by valves opening) the drive control increases the motor speed to increase the flow rate and pressure. Why Use A Variable Speed Drive System? Because it saves energy and money. Here's how: electricity is expensive. The figure below shows the approximate cost of one brake horsepower (bhp) at various electrical costs per kilowatt-hour (kwh). Open or Close the saving values below with the icons. Flow decreases at the same rate as motor speed decreases. Energy costs decrease as the cube of the flow (motor speed) decreases. So, theoretically, a 25% reduction is flow results in a 58% reduction in energy usage. System pressure is reduced by the square of the flow decrease (speed of the motor). The same 25% reduction in flow will result in a 44% reduction in pump pressure. Practical experience shows that only about 50% energy savings can actually be achieved before the system pressure is reduced to a point where adequate system flow is not available. On design days (tower system able to make 85°F) and when a plant is operating at full capacity, the full pump performance (full power) is required. A plant will see reduced needs for water flow when cooler tower water temperatures can be achieved. When 70°F water can be maintained, approximately 50% of design flow will be required for chiller condenser and hydraulic heat exchanger cooling. Additional savings will be achieved when standard pumps have more pressure available then the system requires (i.e. when you must throttle the discharge valve on the pump). When the discharge valve is throttled, nearly full motor power is required. The variable speed drive system will reduce the motor speed so that the pump output matches the system requirement at reduced power usage levels. Additional savings will be achieved when standard pumps have more pressure available then the system requires (i.e. when you must throttle the discharge valve on the pump). When the discharge valve is throttled, nearly full motor power is required. The variable speed drive system will reduce the motor speed so that the pump output matches the system requirement at reduced power usage levels. When a plant is operating at full capacity, the full pump performance (full power) is required. 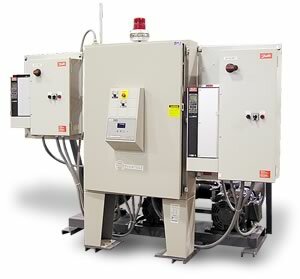 A plant will see reduced needs for water flow when machines are in and out of service and as mold temperature control units are used rather than direct chilled water to the mold. When a mold temperature control unit is used, and operated at as little as 20°F higher than the available chilled water temperature, rather than using direct chilled water flow, only one half (.5) of the standard flow is required. Savings will be achieved when the system water requirements are reduced caused by closing or throttled cooling valves. When valves throttle and close, pump pressure will increase which will cause the pump speed to be reduced to maintain a constant system pressure. Multiple parallel pump system can be controlled with one drive with both pumps' speed varied together. Or, a preferred system will use a drive for each pump with a common transducer input with one of the drives used to control the other using only the pumping capacity that is necessary. And, variable speed drives can be used on your tower fans to save additional energy. Advantage can provide engineered solutions for your new water system or as a retrofit to replace existing on/off motor starters. Ask your local Advantage Representative for more information or call Advantage at 317-887-0729 for a no obligation proposal. For more information about variable speed drives call the Advantage Sales Department at 317-887-0729. Would you like to Download FYI #284 to your browser?